Record lending by the U.S. Small Business Administration (SBA) resulted in 679 loans to NH small business&comma; totaling $135 million for FY2018. Greta Johansson&comma; NH SBA district director&comma; says the organization is fortunate to have such strong relationships with lending partners. 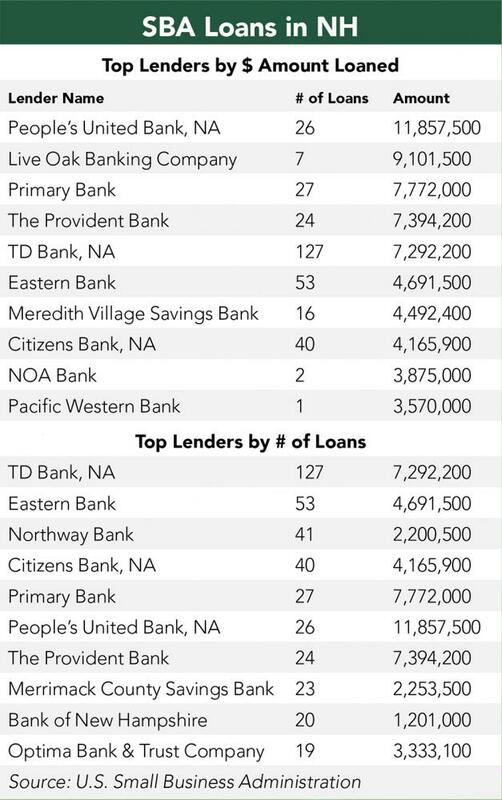 “TD Bank led the way on the number of approved loans&comma; and People’s United Bank and Granite State Economic Development led the way with high-dollar-volume lending in our 7(a) and 504 programs&comma; respectively&comma;” she says. According to Johansson&comma; the lion’s share of loans went to professional services type of businesses&comma; such as law firms and accountants&comma; with a total just shy of $19.4 million. There were also 90 loans in the hospitality industry at $19.2 million and 113 construction loans valued at about $11 million. Nationally and locally&comma; FY2018 saw significant growth in smaller loans&comma; including a record amount lent in the micro-loan and community advantage programs. Helping to drive that&comma; Johansson says&comma; is Axion East&comma; a Boston-based firm&comma; which has become active in NH in the past few years and the Regional Economic Development Corporation&comma; based in Raymond&comma; coming onboard in 2017. The SBA also provides tools including Lender Match&comma; a platform that lets entrepreneurs complete a quick free online form&comma; without registration that then connects them with a lender within 48 hours. To help people purchase a franchise&comma; the SBA hosts a directory of loan eligible franchise brands. For more information&comma; visit sba.gov/nh.